In 2017, Latrobe Regional Hospital (LRH) implemented the Healthy Choices guidelines (HCG) in two on site cafes and staff catering menus. The Chief Executive and the executive team recognise the importance of having healthier food and drink options available for staff, patients and visitors as part of their broader commitment to promoting healthy lifestyles in the community. LRH’s switch to healthier café and catering menus coincided with a major expansion of the health service, which included a new cardiac service for diagnosing and treating serious heart conditions, a new emergency department and a new café. LRH also took over management of an existing onsite café around the same time. "Our team felt we needed to do more to promote a healthier way of life to our community and our staff." The focus on staff health was included in LRH’s Statement of Priorities with the Department of Health and Human Services. And LRH is also working towards the Healthy Eating benchmarks of the Achievement Program. LRH established a health and wellbeing committee which reports to the executive level. The committee is chaired by the General Manager of Support Services and includes key staff such as nurse unit managers, dietitians, physiotherapists, occupational therapists, mental health nursing staff, the WorkCover Coordinator and General Manager of Business Services. Student dietitians from Monash University also assisted LRH implement the Healthy Choices guidelines during a 10 week placement. The committee initially developed a health and wellbeing policy, which stated that all onsite retail food outlets and catering will comply with the Healthy Choices guidelines. 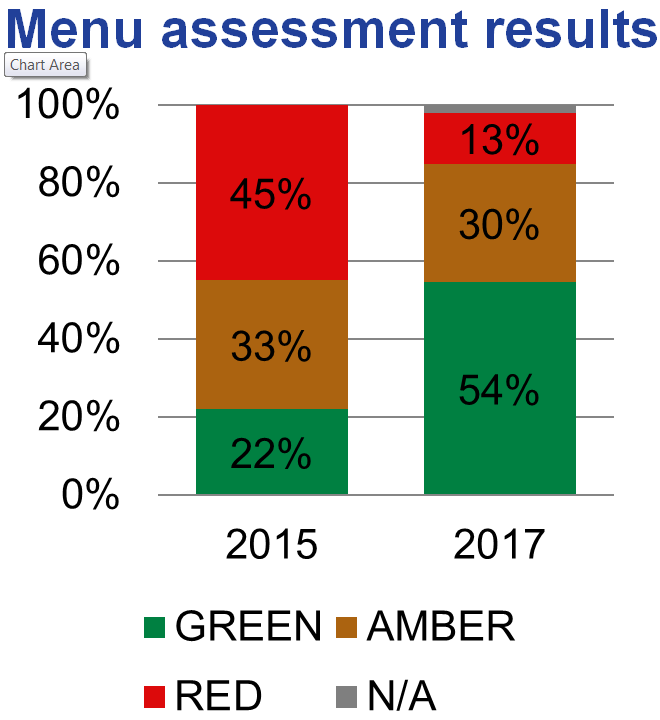 The student dietitians assessed all the foods and drinks sold in the cafes to find out the percentage of GREEN, AMBER and RED items available at each one prior to the implementation of the HCG. This was done using FoodChecker, the Healthy Eating Advisory Service’s free online menu assessment tool. The assessments revealed that, all together, the cafes provided 22% GREEN items and 45% RED. The reports included advice on healthier changes they could make to reduce the amount of RED items and increase the GREEN. The student dietitians then worked with the chef and café manager to identify suitable recipe modifications and product swaps. After implementing the students’ recommendations and the HCG, the foods and drinks were reassessed on FoodChecker, which revealed the overall amount of GREEN items in the cafes has increased from 22% to 54%, and the amount of RED items had decreased from 45% to 13% - in under two months! The major changes LRH made included removing all fried foods, confectionary, cakes, slices, and chips, and significantly reducing the amount of sugary drinks on offer. LRH also added many delicious new items to the cafes, particularly snacks such as fresh fruit salad, vegetable and dip snack packs, mixed nuts, and fresh fruit for only 80c. And the chef now prepares tasty meals that use less added salt, sugar and saturated fat. LRH communicated changes to staff, patients and guests via the staff newsletter and flyers round the site. LRH also built healthy eating into their recruitment process by requiring all new café staff to have an interest in promoting healthy eating, and providing them with training on the Healthy Choices guidelines. As a result, all café staff are committed to promoting healthier choices, and can confidently talk to customers about the traffic light system. There was some initial resistance to the changes from members of the hospital community, however the feedback has been overwhelmingly positive. A survey by the student dietitians found that 72% of customers are pleased with the taste and variety of the food and drinks. In fact the cafes have earned new customers, such as people without any connection to the hospital who make the effort to eat there, and one staff member who has been working at the hospital for 17 years who had never eaten from the cafe until Healthy Choices was implemented! "Our staff and visitors have been pleasantly surprised by the menu and how affordable it is." LRH is fortunate to operate its own cafes, which gives the hospital greater control over the foods and drinks they provide. The hospital views the café as a service for staff and guests, so the financial objective is to break even rather than make a profit. This means LRH can make healthier options more affordable, which supports its commitment to promoting healthy lifestyles in the community.